Darter: Darters are fish-shaped water dwellers from gummland. Lacking bones, they nevertheless evolved into powerful, streamlined swimmers. They breathe by sucking water into an intake vent near the understide of the head, passing it over their gills, and squirting the water out a rear-facing siphon. They usually swim using their fins, but can expell a jet of water from their siphon for an instant burst of speed. Darters have radiated to fill similar niches that fish did on Earth, from shark-like apex predators to plankton-eaters to grazers. 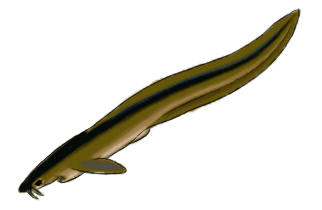 Any elongated, eel-like varieties are commonly called wigglers. Looper: Loopers are a group of small to medium sized animals that fill herbivore and omnivore niches, similar to rodents, rabbits, and antelope on Earth. They are an important part of the food chain, serving as prey for many larger animals. Loopers are monopods. At slow speeds, they push their body forward with their leg, rest their weight on a front appendage under their "chin", then bring their leg forward again to repeat the cycle. At high speed, they hop in long bounds. These animals are alert and wary, quick to flee at the slightest disturbance. Their high speed allows them to escape most predators if they have warning. Small loopers may retreat to burrows for shelter, larger species may take cover in brush or simply live in large herds and keep a sharp eye out in flat, open areas. Jewel Dug: A burrowing predator and scavenger that has been domesticated by Mants as a sentry, companion, and working animal. They are particularly valued for pest control, including devouring large numbers of sunflower worms. Jewel dugs are known for their iridescent colors, rapid digging speed, and the powerful grasping and tearing claws at the end of their front walking limbs that double as shovels. When hunting, they grasp prey with their claws while stabbing with the raptorial appendages normally stowed folded under their thorax. Jewel dugs have gone feral on most worlds in the Verge. They have significant established wild breeding populations on Gateway, Žemyna, New Carolina, San Agustín, and Garcia's World. 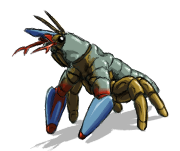 Murderbug: An aggressive predator, attracted to Mant settlements to prey on pests that feed on Mant garbage and crops. They have adapted to tolerate Mants, and the Mants find them useful enough that they take the murderbugs with them when they colonize new worlds. However, people other than Mants are not safe from their predatory tendencies. Murderbugs are excellent runners and jumpers, chasing down their prey or leaping on it from surprise then stabbing it with bladed raptorial appendages. They often hunt in packs numbering from two to twenty. 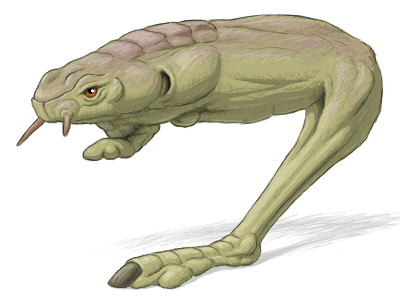 Shield-Footed Landolin: Landolins are herbivores, domesticated by Mants for meat. They form herds with a matriarchal hierarchy led by the oldest female. Males battle each other for the right to accompany the herd and mate with the females; they vigorously defend their herd from other males and dangerous intruders. The males have colorful enlarged front walking limbs that are used for display. When display fails, they also use them for bludgeoning each other or anything else they don't like. Escaped herds of landolins are not uncommon on worlds that have significant Mant populations. Steamroller: The steamroller is a large Mant domesticate, used for meat and, in the past, traction. It is a herbivore with a cranky disposition. 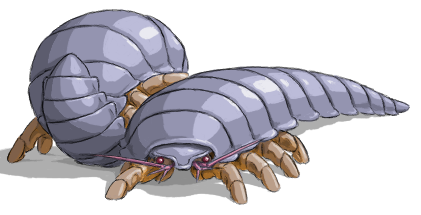 Heavily armored with thick chitinous plates, when frightened it will curl up into a ball for protection and squirt out clouds of an irritating aerosol that acts like tear gas. It is also capable of rolling over hard, level ground like a wheel by curling most of the way up but letting its legs stick out, then kicking with its legs for propulsion. Its normal gait at low speeds or in rough terrain is simply walking on its eight legs. Steamrollers gather in loose herds. The bulls fight for dominance and mating rights by curling up and slamming into each other as hard as they can. Steamrollers come to know and trust their usual herders and caretakers. However, they can be quite belligerent towards strangers, attempting to crush them by rolling over them or slamming into them. Fortunately, when curled up steamrollers cannot see where they are going so their targets can often jump out of the way. 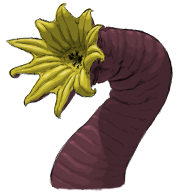 Sunflower Worm: A common pest of Mant hive houses, particularly when they infest the fungus gardens. Sunflower worms are omnivorous, mature rapidly, lay hundreds of eggs, and pack a painful defensive bite with a mild venom. When threatened, they rear back and open their lip-tentacles, revealing the vivid yellow of their mouth's interior as a warning. Large individuals can reach 2 meters resting length, but most are sexually mature at 40 cm long. They are attracted to areas with food, cover, and water, particularly food storage areas and garbage. They are now a common pest of Human and Gummi houses as well as those of Mants. Eel-worm: Vast anadromous runs of eel-worms sustain some of Jefferson's most productive fisheries. Many different species of eel-worms exist, some of the larger can pose a threat to humans when they attack boaters, swimmers, or people venturing too close to the water's edge. 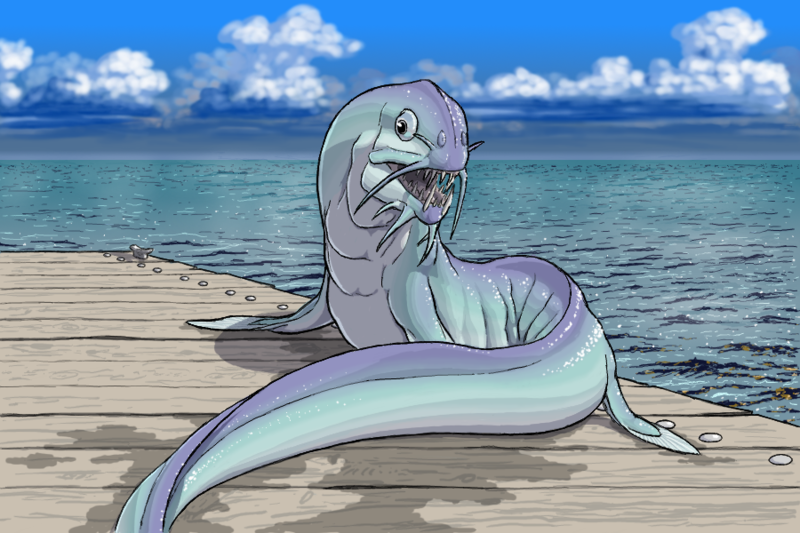 Terror Eel: A bio-engineered monster derived from Terran lungfish, catfish, and morays; terror eels were originally intended as game and commercial fish that could survive in San Agustín's highly saline seas. Things did not go as intended and these large, voracious predators rapidly proliferated. With a strong predatory instinct and the ability to spend up to several days out of water in humid or damp conditions, they became a menace to people living near or working on the water. Efforts to control terror eels around populated areas with targeted biocides, diseases, and gene drives make the water safe from them near most settlements, but traveling into deep rural areas risks encounters and sometimes migrating individuals will show up at town shores and cause panic. Anvilback Arrowhead: While not the largest of the arrowheads, the anvilback is perhaps the most dangerous to people. Growing to the size of a Bengal tiger, it adapts well to farmland, disturbed areas, and semi-urban environments. 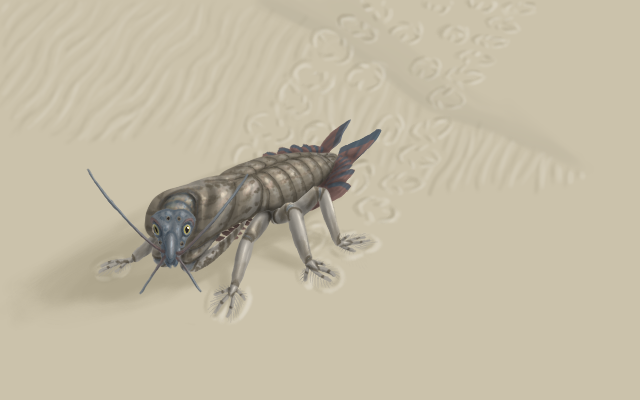 It is an opportunistic predator and scavenger, eating nearly anything that it can overpower. Anvilbacks are named for the flat-headed spines that grow from their back. They use these to recognize their own kind, and for displays to attract mates or intimidate rivals. Bush Arrowhead: Bush arrowheads are typical of the small-to-medium sized arrowheads of Žemyna – long bodied, short-legged, capable of rapidly scurrying through brush, up trees, across water, or down burrows in pursuit of their prey. Bush arrowheads are often found near people, and have colonized many urban areas where they prey on possums, rats, pigeons, starlings, squirrels, cats, small dogs, and other small animals as well as raiding garbage. Bush arrowheads subdue their prey by wrapping their bodies around their quarry, holding it tight with their claws while they use their jaws to deliver a lethal bite to their prey's vital spots. Greater Moloch Arrowhead: The greater moloch arrowhead is Žemyna's largest land predator, reaching masses of 3,000 to 4,000 kg as an adult. They are not found close to civilization, requiring large herds of prey animals to sustain their bulk. The greater molochs live in small family groups, fiercely defending their territory from other groups of greater molochs. The younger members of the pack use their speed to chase down and harry prey, driving them into ambush where the size and strength of their parents can be used to take down their quarry with less risk. This picture of a yawning greater moloch shows the typical dental arrangement of arrowheads. Their jaws are modified limbs, normally stowed folded under their head. The last "wrist" segment features a single large fang that can be independently oriented, ideal for restraining prey, while the "forearm" section contains many smaller teeth for sawing up flesh and crunching bone. Leviathan: The largest of Žemyna's animals, Leviathans are enormous pelagic filter feeders, cruising the oceans sucking in vast quantities of plankton to feed their enormous bulk. Their long bodies may recall the sea serpents of old Earth lore, but these beasts are harmless to people unless provoked. 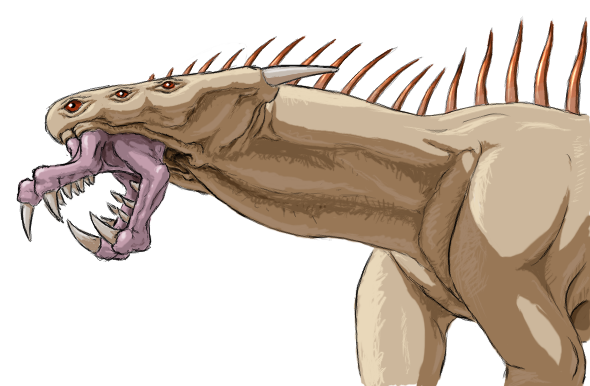 Leviathans are mouth brooders. The female lays eggs which the male fertilizes and then takes into the brood pouch in his throat until they hatch. The young feed on plankton caught in their father's sieves, occasionally venturing out but returning to the shelter of their father's brood pouch until they are mature enough to survive on their own. If harassed, a leviathan will first attempt to flee. But if sufficiently provoked, it will turn on its attackers, ramming with their snout or smashing with blows from their body. Legworm: Žemyna's legworms are opportunistic hunter-scavengers. Their elongated, segmented bodies are boneless, capable of contorting to squeeze through narrow crevices or stretching to nearly double their resting length. Each segment has a pair of legs equipped with a sharp claw that they use to climb or to dig into their prey like meat hooks. The head ends in a swarm of sensory tentacles, and can evert a set of retractable, four-part jaws with long, sharp piercing fangs. Legworms come in many species, from 10 cm long wiggly things that hide under rocks and damp logs to anaconda-sized serpents. Each of a legworm's segments contains redundant organs - a heart, ganglion, lung-gills, kidneys, and so on. This allows it to sustain significant amounts of injury before dying. Only damage to the brain, in the foremost segment, will instantly incapacitate the creature. A primary nerve cord, a gut, and four great vessels run the length of the creature. Severing the main nerve cord keep the brain from controlling anything below the point where the break occurred, resulting in the lower parts writhing around. Opening one of the great vessels will cause muscular contractions around the injury that pinch it shut, preventing massive blood loss but reducing the legworm's endurance.